The rules? Everything has to be edible. Also, the gingerbread house does not have to be a house. Kaeli Joyce from Mobile Ed and Scott Hausman from Lexham Press teamed up to create this unique thatch-roofed house. The thatching was made from shredded wheats, cut in half front to back and top to bottom. It was tricky to keep the shredded wheat from falling apart, but the reward was the rough-looking roof. The frosty windows were made from sugar mixed with water, which was heated on a stove. The syrupy mix was then poured into the frames, which were lying flat on parchment paper. The chimney has a gingerbread frame, covered in red chocolate rock candy which was attached with royal icing mortar. You might notice that different colors of the same chocolate rock candy are also embedded in the base of the house. Pro tip: Gingerbread house frames are usually put together with royal icing, but Scott and Kaeli used the same makeshift syrup from the windows to glue everything together. It was difficult to get the thickness right and put pieces together while the syrup was hot, but the stronger joints was worth the extra work. Elizabeth Gifford from the Ops team paired up with developer Auresa Nyctea to create this unique, blocky house. The dark brown blocks that form the main structure of the house are cocoa Rice Krispies. The gray “cobblestone” blocks are also Rice Krispies, but they were mixed with black frosting. The sugar cube archway used a red gel food coloring to create the “candy cane” effect. Since the food coloring was a gel, it didn’t dissolve the sugar cubes. The gummy blocks in the pathway are Trader Joe’s Fruit Jellies. Mackenzie Stevenson from the facilities team went a different direction: she made a castle. The frosted mountain base was purchased from the store—the rules didn’t say you had to make everything yourself! Mackenzie made the colorful entryway with half a graham cracker for a base and “Princess Glitter Gel” icing. The icing way the hardest part of this design—it’s runny, and didn’t dry in place very well. The tower was made with sugar cubes and topped with whipped icing. Mackenzie was going for the “Ice Queen” look. Fun fact: None of this was made with gingerbread—the rules just said it had to be edible! Jacob Cerone (one of our Logos Pros) decorated this classic gingerbread house with a twist: a Lego candy dog house. The dog was made out of spice drops. An assortment of candies make the cobble-stoned pathway leading to the front door, where a pretzel wreath hangs above the entryway. Sarah Vaughan from sales and Kurt Andres, a developer, won the contest (and two extra tickets for the raffle!) with this gingerbread mine. The roof shingles were made from fondant, hand pressed and sprinkled with cinnamon. The boardwalk is pure chocolate—Tootsie rolls for the posts and bars for the walkway. The water is a mix of melted sugar and blue food coloring. Abigail Stocker from publications and Wyatt Shedd-Stewart from Proclaim produced this gingerbread “house” based on the St. Andrews Church in England (which happens to be the church in our Lexham Press logo). The roof is made from chocolate wafers and pretzel sticks with a light dusting of shaved coconut and powdered sugar. The stones are pinto beans, which were painstakingly attached to the tower. One of the more interesting things about this house is that it was actually created to scale—they used a 3D modeling program called SketchUp and data from Google Maps. They made a “stained glass” window. It’s an arrangement of cut up gummy butterflies. There’s a vanilla wafer slice at the base, and it’s all framed by pretzel sticks. Liz Roland from Mobile Ed demonstrated that with a basic kit and some candy, you can still create a festive gingerbread house. A little cotton for snow, plus a candy wreath, and you’ve got a simple, wintery decoration for the holidays. Ben Gregoire from the video team modeled his gingerbread creation after our historic office building—making a point to only use candies that he likes to eat. The large pillars running up the sides are pretzel sticks. The curb is made from Pirouline rolled wafers. A modified town gingerbread kit plus some Pop Tarts made the walls, which are held together with cake icing and peanut butter. The roof is a blend of broken peppermint canes and sixlets. The ground and lower walls are covered with smarties, and the windowsills are mini marshmallows. The red windows are gummy tape. The hardest part of this design was modifying the gingerbread kit—Ben had to cut the brittle bread into walls using an X-ACTO knife. Liliya Moroz, a designer, went solo to create this beautiful gingerbread cabin. 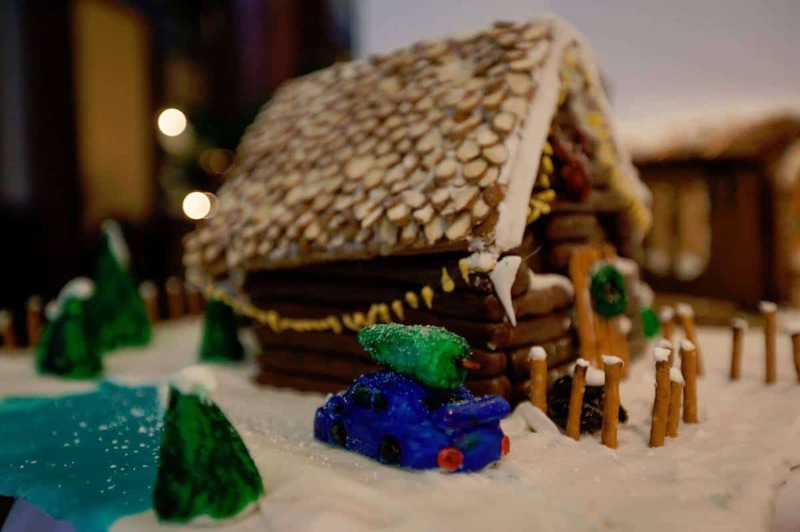 One of the most unique features of this piece was the car made of fondant, complete with a Christmas tree on top. Liliya shaped the fondant and mixed it with food dye. The deer head above the front door is also made from fondant—though Liliya says next time she would break a pretzel in half to make the antlers. The gingerbread frame was wrapped in tootsie rolls to create the “log cabin” look. Draped around the cabin is a string of “Christmas lights” which Liliya made by placing the string on parchment paper and squeezing melting yellow chocolate onto it through a Ziploc bag. Much like the thatch-roofed house, the windows on this one were made with melted sugar. The lake “mistake”: The snow wouldn’t stick to the almonds on the roof, so Liliya melted sugar and mixed it with water to help it stick. Some of the mixture fell on the snow around the house, so Liliya added some food coloring and made the “mess” bigger to create an awesome little lake. Stay tuned to see how we prepared Faithlife’s offices for Christmas and to hear about our annual Christmas party. Great Work ! ! ! I was looking around for ideas to add to my Log Cabin Gingerbread house. . . Thank you for sharing your talents… I did a stop motion video showing the build up of my house. . . Again thanks for your posting.